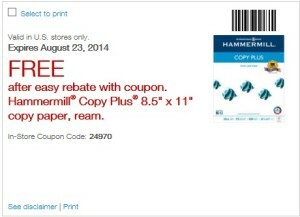 Now through August 23, you can pick up a FREE ream of 8.5″ x 11″ Hammermill Copy Plus copy paper at Staples. 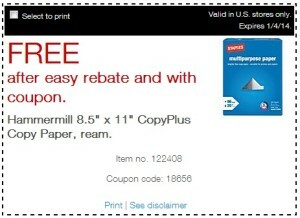 You will need to print the COUPON from Staples site and submit the Easy Rebate. 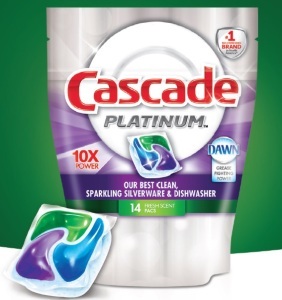 Stock up now, you never know when the great deals on paper will end. If you have kids, this is a great way to donate to their class while keeping costs down. 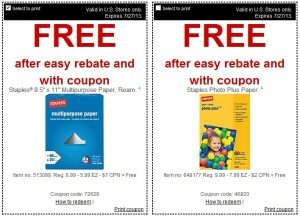 From now until Saturday (1/4/14) you can pick up a Free ream of CopyPlus paper at Staples. 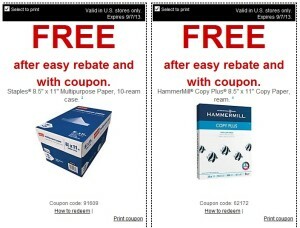 This COUPON and Easy Rebate submission is required for paper to be free. As we start a new month of couponing, free paper comes in hand with all of those new printables! 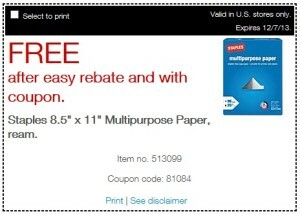 This week we can pick up a free ream of 8.5″ x 11″ paper at Staples with the COUPON and Easy Rebate. Offer expires 12/7/13. Remember, to get these items free you must print the coupons because the coupons trigger the rebate to print. Easy rebates give you the option of a mailed check, or a PayPal deposit. 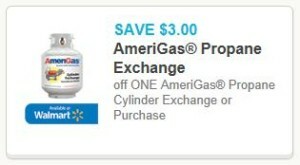 BBQ season runs all year-round here, so I am glad to see we have a new $3 coupon and $3 rebate for AmeriGas Propane. Rebate: $3 Mail-In Rebate on an AmeriGas Propane Cylinder Exchange or Purchase between 4/1/2013 and 4/1/2014. Note: This is the same rebate that was posted before. If you already submitted it, you will not be able to submit it again. 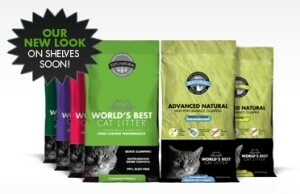 For a limited time, you can try a free bag of World’s Best Cat Litter with this Mail-in Rebate. Valid on 6, 7, or 8 lb. 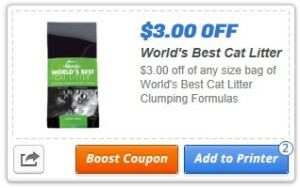 If you have already tried World’s Best Cat Litter and you like it, we have a $3.00 coupon available too. The coupon can be boosted up to $5.00. 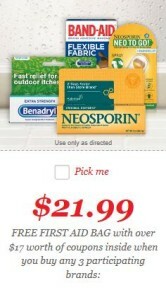 Buy any 3 of these particpating products: Band-Aid Brand Adhesive Bandages, Aveno Anti-Itch, Johnson & Johnson Red Cross Brand, Neosporin Ointment Cream, Neosporin Exzema Essentials, Benadryl Topical, and/or Polysporin, send in the COMPLETED REBATE CERTIFICATE, and receive a FREE First Aid Bag with over $17 worth of coupons inside. Purchases must be made between 5/1/13 and 10/31/13. Shopping at Staples for back to school supplies? Be sure to print these coupons and score a FREE ream of Staples 8.5″ x 11″ Multipurpose Paper, and Free Staples Photo Plus Paper.